Soccer fan clubs helped topple Hosni Mubarak. Now they’re protesting the Morsi regime and its defense of murderous security forces. The days of Morsi’s reign are now being challenged in Cairo where on Monday demonstrators battled police in street fights that lasted for hours. In Suez, thousands left their homes and marched at 9 pm in violation of curfew laws. And at Ground Zero, in Port Said, demonstrators declared their own state while thousands chanted, “LEAVE! 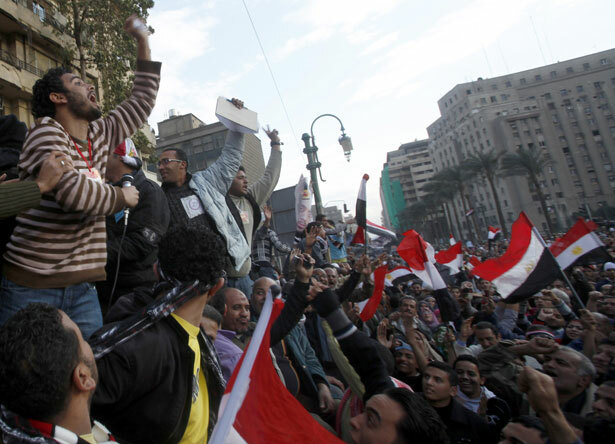 LEAVE!” to Morsi, the same rallying cry used in the last days of Mubarak. The future for Morsi is unclear, but what is clear is that the ultra clubs aren’t leaving the stage of Egypt’s history until there is justice and those in the state and military apparatus are held accountable not only for what took place in Port Said but for all the hundreds who’ve been killed protesting over the last two years. Since this latest eruption, sixty more are now confirmed dead, including Tamer al-Fahla, former goalkeeper of the al-Masri team, and Mohammad al-Dadhwi, who played for Port Said’s al-Mareekh team. There will be more deaths to come, as Morsi seems determined to crush and not heed the opposition. The great tragedy is that clearly, as long as there is no justice there won’t be peace. Read Dave Zirin's take on how LGBT equality plays into this year's Super Bowl.